Whenever we move from one Android device to another, we mostly focus on transferring our photos, videos, contacts, and other data files. Too often, we forget to transfer messages from Android to Android, which might backfire in the long run. From personal chats to important information, our SMS messages may contain crucial details at times. Therefore, when you transfer from old Android to new Android, make sure that you also migrate your messages. 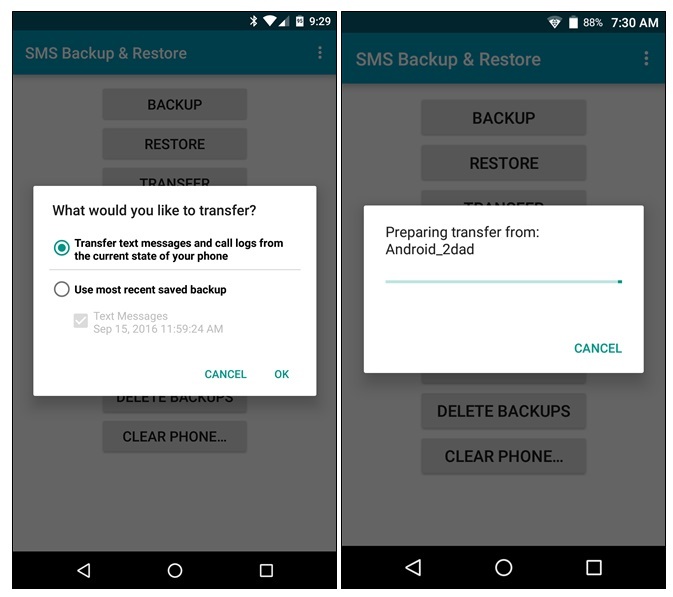 In this guide, you will learn 5 different ways to transfer SMS from Android to Android. If you are looking for a hassle-free and quick solution to transfer text messages from Android to Android, give dr.fone - Switch a try. With this tool, you can directly move all the important data like SMS from one Android to another. Compatible with all the major Android and iOS devices, it allows you to transfer text messages not only between Android and Android, but also between Android and iOS. 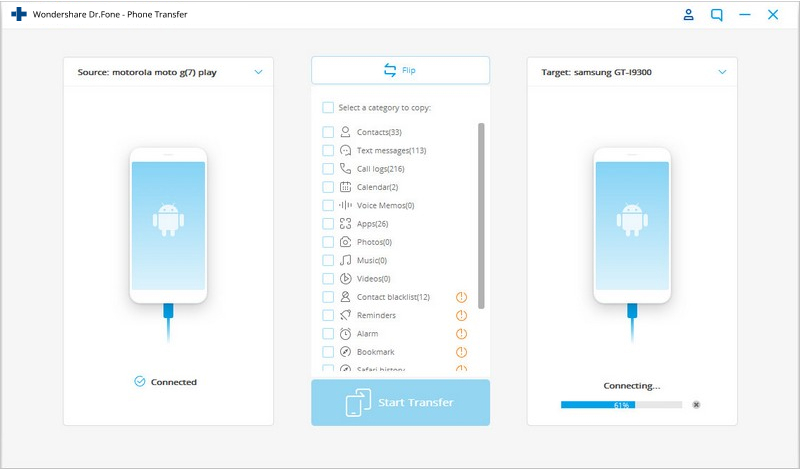 Easily transfer every type of data from Android to Android, including messages, music, videos, photos, contacts, call logs, etc. Transfer messages between two devices even of differenet operating systems (iOS 12 and Android 8 included). Work perfectly with Apple, Samsung, HTC, LG, Sony, Google, HUAWEI, Motorola, ZTE, Nokia and more smartphones and tablets. Latest Windows 10 and Mac 10.13 supported. With just one click, you will witness how to transfer messages from Android to Android in a short while. 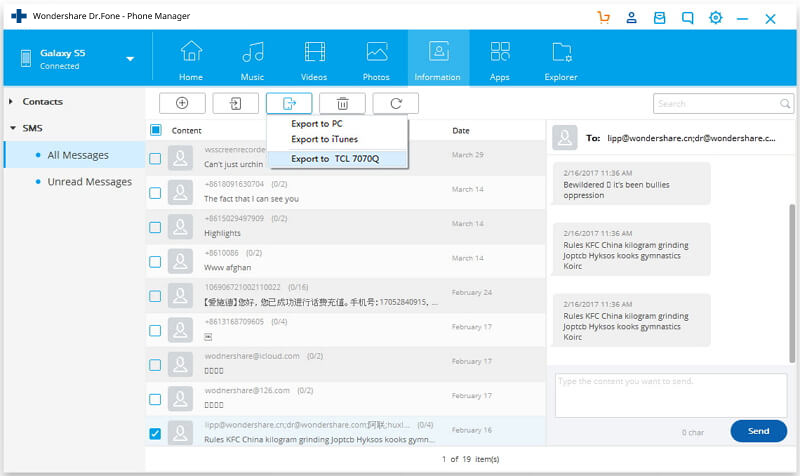 The desktop application is available for Windows and Mac, and comes with a free trial version as well. To learn how to transfer text messages from Android to Android in one click, follow these simple steps. Launch dr.fone toolkit on your computer and select the “Switch” module from its welcome screen. 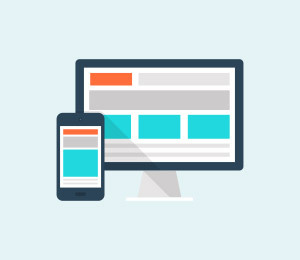 Connect both the Android devices to the computer. In no time, the application will detect them automatically and display two Android phone icons. Check which Android will transfer the SMS messages and which Android will receive them. If you want to change their positions, click on the “Flip” button. Now, simply select the type of data you wish to transfer. To transfer SMS from Android to Android, select the “Text messages” option from the list. After making the appropriate selections, click on the “Start Transfer” button. This will initiate the transfer of your messages and other data from the source to the destination Android. Sit back and wait for a while for SMS transfer to complete. Once it is done, you will be notified with a prompt. Then you can remove both Android devices safely. In this way, you can transfer messages from Android to Android with a single click. 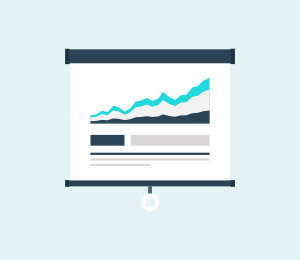 The process is not only easy, but is also extremely time-saving as well. Still bewildered? See the video for more straightforward Android SMS transfer operations. Sometimes you may not want to transfer all Android messages in one click, but would like to select only important texts to transfer to new Android phone. For this requirement, one click for all SMS transfer may fail to meet your expectations. In this situation, you'd better opt for dr.fone - Transfer (Android), which is developed to complement Android SMS transfer by meeting selective-transfer needs. 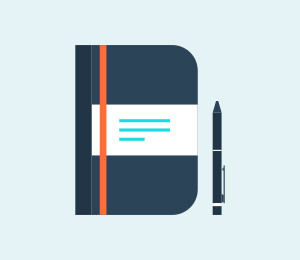 Select and transfer desired messages, contacts, call logs from Android to Android. Export/import your music, photos, videos, contacts, SMS, apps etc. to computer/Android. Parse and transfer iTunes messages to Android (vice versa). This Android SMS transfer tool is designed to meet cutom transfer requirements. Just transfer only wanted messages to new Android, and leave unwanted ones on old Android. Many users take it as an ideal solution to minimize SMS storage consumption in new Android. 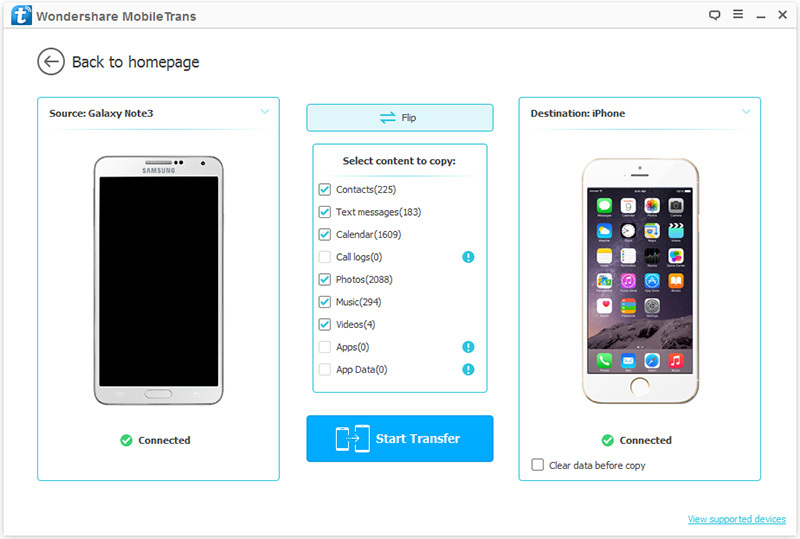 Install and launch dr.fone, and select the "Transfer" option from the main screen. Connect the two Android devices to your computer using the USB ports. Click the upper left corner and you can see the names of both Android devices. Click on the name to specify it as the source Android for SMS transfer. Click on the "Information" tab. In this new screen, you can see the Contacts and SMS on the left column. Click on "SMS" to access all Android messages. Scroll on the screen to view which messages are wanted ones on your source Android. Then select the SMS threads, click the "Export" icon on the top bar, and choose [Name of target Android]. That's all the process of selectively transferring Android messages to new device. Pretty easy, isn't it? There are also a few readily available apps that you can use to transfer text messages from Android to Android. For instance, the Android SMS Transfer is one of the time-honored apps that can help you. 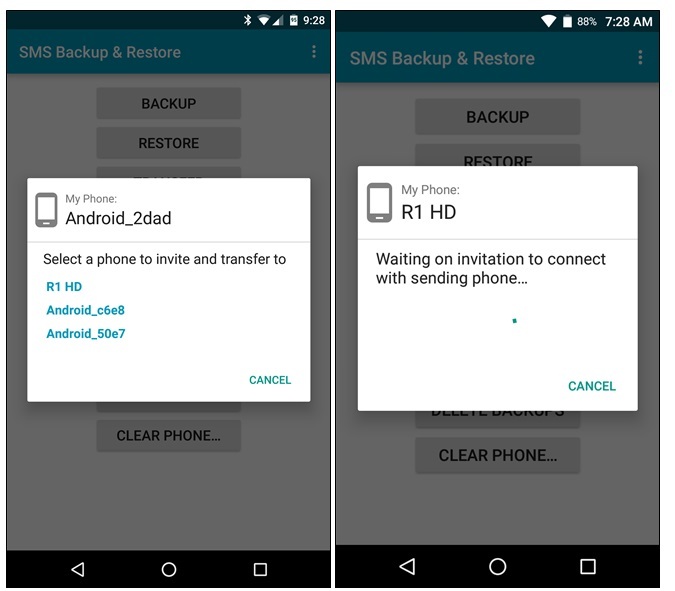 The app will first take a backup of your Android messages and can later restore them to the target Android device. The messages will be exported to an Android SD card, which will later be used for SMS restore. While the SMS transfer process is not as fast and direct as dr.fone - Switch, it can meet your basic SMS transfer requirements. 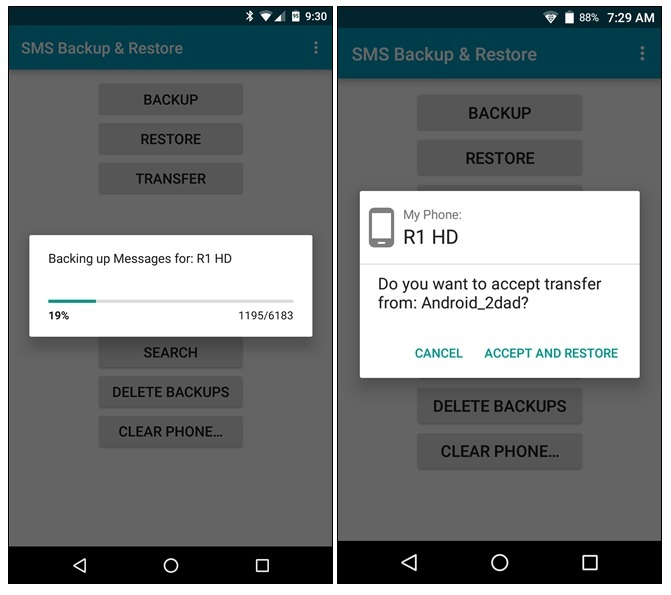 Here’s how you can transfer SMS from Android to Android using this Android SMS Transfer app. First of all, download the Android SMS Transfer app on the source Android and launch it. From its welcome page, click on the "Backup SMS" option. You will be asked to name the backup file of your Android messages. 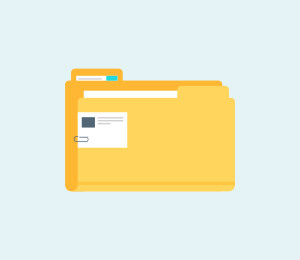 Just enter any file name and proceed. 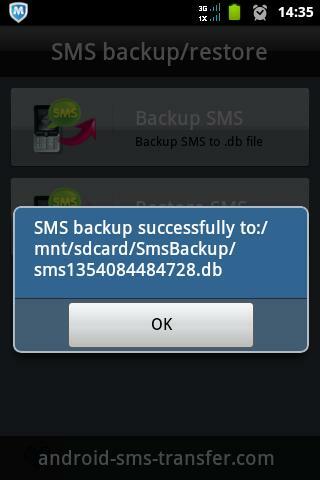 The app will show that the SMS backup has been taken and stored on the Android SD card. Just safely remove the SD card that contains the Android message backup, and insert it into your new Android phone. Launch the app once again and click on the "Restore SMS" option. 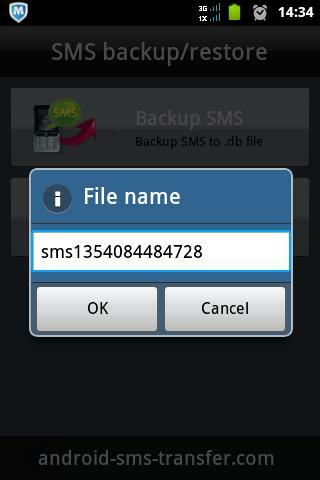 Browse the backup file having your text messages and restore them to the target Android phone. In this way, you can transfer messages from Android to Android by using an SD card. Though, it will only transfer the text messages and will not include any other media data. While the technique is not widely recommended, you can use the native Android Bluetooth feature as well to transfer text messages from one Android to another. Since Bluetooth SMS transfer is gradually getting obsolete, the feature might not be supported on all Android devices. Also, it would take a lot of time to send your Android messages via Bluetooth. The method is also not recommended from a security perspective. If the source Android phone has a malware, then it can be transferred to your target phone as well. Therefore, you should only consider this as your last resort for Android SMS transfer. You can follow these steps for Android SMS transfer via Bluetooth. To start with, bring the source and the target Android devices in close vicinity. 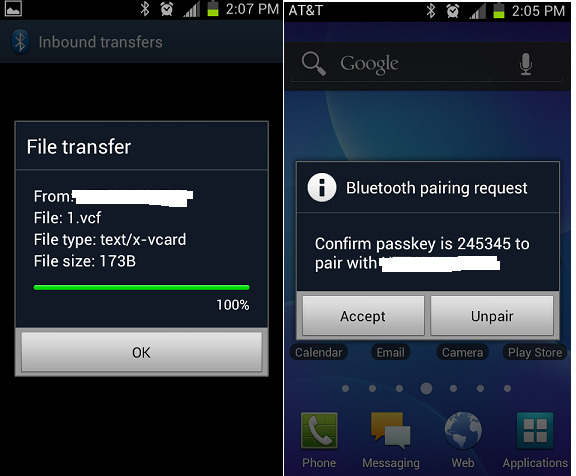 Turn on the Bluetooth feature on both Android devices and pair them by confirming the passcode. Now, go to the Messaging app on the source device and select the messages that you wish to transfer. Go to its Settings and choose to "Send" or "Share" the selected SMS threads. After that, you need to send SMS via Bluetooth. A list of all the available Android devices will be displayed. Simply tap on the target device to receive SMS messages. On the target Android, you will receive a prompt for the incoming SMS data. 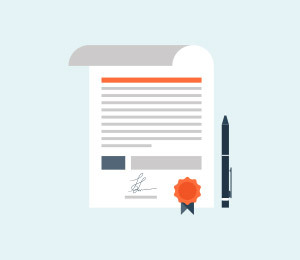 Touch "Agree" and start the SMS transfer process. As you can see, it can be really tedious to learn how to transfer messages from Android to Android via Bluetooth. Not only is this SMS transfer method time-consuming, it would be really complicated to implement as well. 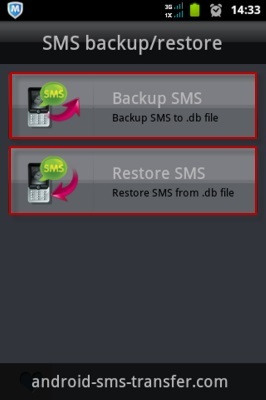 Another smart and easy way to transfer SMS from Android to Android is by using the SMS Backup & Restore app. 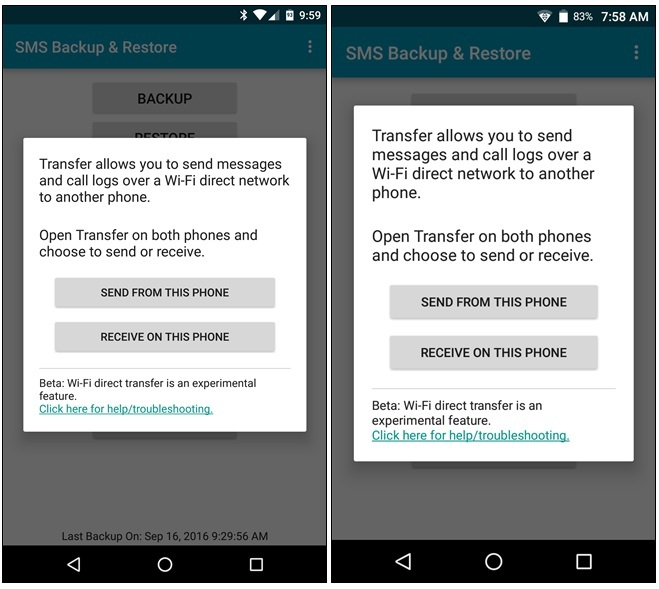 Besides taking a backup of your Android messages and restoring them afterward, it can also perform a wireless SMS transfer as well. 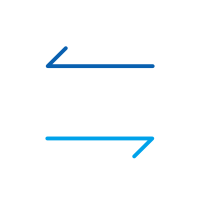 Unlike Bluetooth, this message transfer takes place via WiFi direct, which makes it a lot faster and reliable. The app is available for free and can be downloaded from Google Play Store. Therefore, before you begin, make sure that you have downloaded the SMS transfer app on both Android devices. Later, you can follow these steps to transfer messages from Android to Android directly. 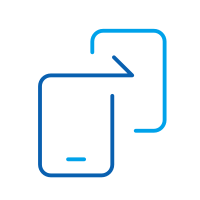 Launch the Android SMS transfer app on both the devices and choose to "Transfer" your messages. You can find "Transfer" on the home page of the app or under its Settings tab. Now, you need to specify the source and the target Android device. On the source phone, tap on the “Send from this phone” option, while on the target device, tap on the “Receive on this phone” button. The target Android will wait for the SMS transfer. On the other hand, you can view a list of all the available devices on the source Android. Simply tap on the target Android device from here. On the target Android, you will get an invitation to connect. Tap on the “Accept” button to proceed. Great! You are almost there. 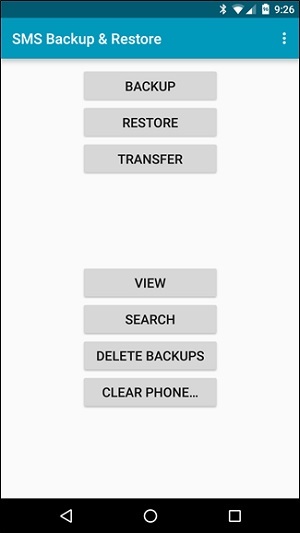 On the source Android, the app will provide an option to send a previous backup file or all the text messages and calls. Choose the relevant option and touch on the “OK” button. Just wait for a while for the Android messages to transfer to the target device. Once the process is complete, you can view the newly transferred messages on the target Android phone. There you go! 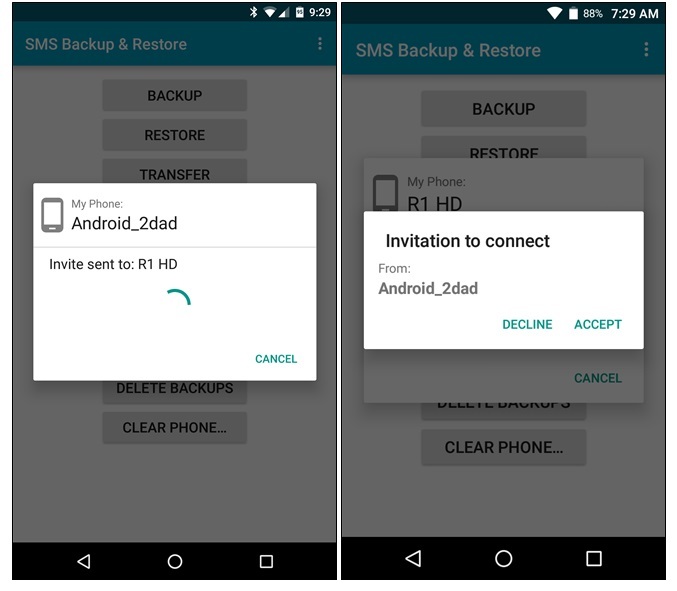 Now with the help of these techniques, you can easily transfer SMS from Android to Android. 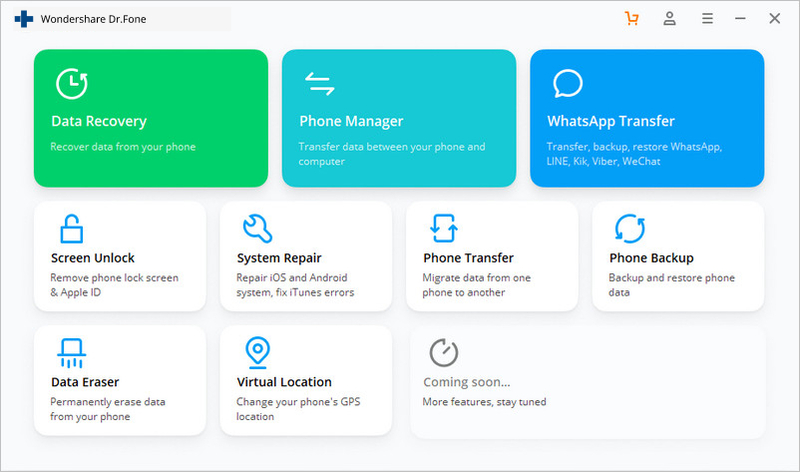 Out of all these options, dr.fone - Switch provides the fastest and most convenient solution, and dr.fone - Transfer makes Android SMS transfer more customized and flexible. You can simply go to its official website and give this freely available tool a try. 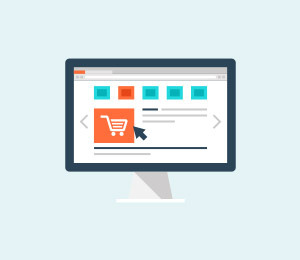 It will let you move your data from one device to another without any hassle.